About the Children's Department: Don't Forget! Three Fun Give-Aways Tomorrow! Don't Forget! Three Fun Give-Aways Tomorrow! Tomorrow I'll be drawing three names for some fun VBS give-aways . 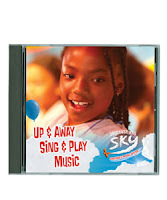 . . two Up & Away music CD's from Group's Sky VBS and one Super Duper backdrop from LifeWay's Amazing Wonders Aviation VBS! Be sure to check back tomorrow to see who wins these VBS resources! Thank you Group and LifeWay for making these things available for me to give away!